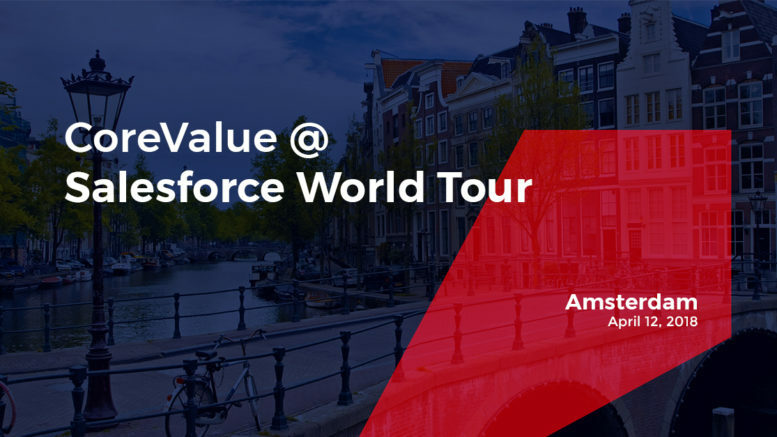 CoreValue is pleased to announce that it is participating in Salesforce World Tour Amsterdam on April 12, 2018. 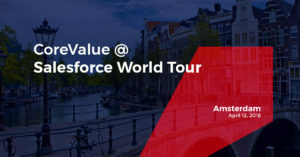 March 17, 2018 – CoreValue today announced that it is participating in Salesforce World Tour Amsterdam on April 12, 2018. As a registered Salesforce partner, CoreValue is joining the world’s leading enterprise cloud provider as part of its community of partners and customers creating a unique environment of innovation, inspiration and learning within every area of lives. Salesforce World Tour Amsterdam is a perfect opportunity to learn the latest in customer experience directly from recognized industry authorities; attend over 30 innovative expert-led sessions; and connect with other Salesforce professionals. The event presents the best outlook on future enterprise software, including Artificial Intelligence, cloud, mobile technologies and IoT to transform businesses and help them better understand their customers. “If you are attending Salesforce World Tour Amsterdam, we would be delighted to spend some time with you to discuss how technology solutions like Lightning, Marketing Cloud, Salesforce Mobile, etc. can help you transform your customer engagements. Feel free to stop by our booth in the Amsterdam RAI and speak with our experienced professionals. Moreover, you will have a chance to win a 10-hour FREE consultation package with our top Salesforce team members,” said a representative from CoreValue. CoreValue Services is a US-based software and technology company that delivers cloud and mobile solutions for the Pharmatech, Healthcare, and Financial Sectors to help businesses achieve better agility. 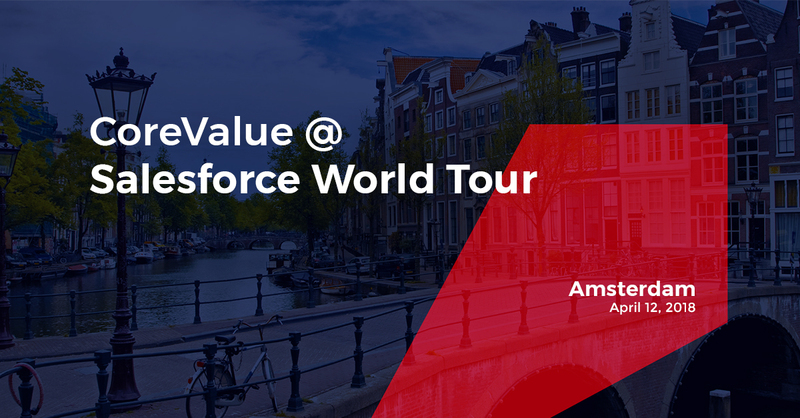 Be the first to comment on "CoreValue is a Gold Sponsor at Salesforce World Tour in Amsterdam"